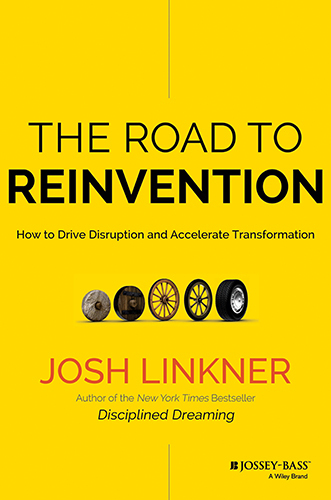 Josh Linkner, CEO and managing partner of Detroit Venture Partners, a venture capital firm located in the Madison Building in downtown Detroit, spoke with DBusiness Daily News about his new book, The Road to Reinvention: How to Drive Disruption and Accelerate Transformation. 1. DDN: What inspired you to write The Road to Reinvention? JL: There have been so many companies that have unnecessarily fallen, ranging from Pan Am Airlines to great iconic brands like Oldsmobile or Borders Books. And the same has happened with communities — think of the many challenges that we’ve had in Detroit. I became interested in reinvention as an ongoing process rather than waiting until something bad happens and waiting to react. It’s the idea of architecting the next chapter from a position of strength rather than having to fight back from adversity. 2. DDN: What are some of the qualities of these successful businesses or “disrupters”? JL: They’re willing to shed the past. In other words, they’re very focused on creating new ideas instead of just protecting the old ones. They’re very excited about defying tradition and are willing to blow up the mold. They also tend to be very scrappy. So instead of complaining about all of the resources they don’t have, they tend to make due with what they have at their disposal. The point is you don’t need a boatful of cash to be a re-inventive person or company. Really, the raw ingredient is imagination — not money or human resources. 3. DDN: Who are some of the “disrupters” in Detroit? JL: Detroit Venture Partners has made 24 investments in companies that we believe have the opportunity to really disrupt their respective industries. One of our investments, for example, is Ginkgotree, which is disrupting the world of textbooks for college students. The traditional way (to buy a textbook) is to buy the paper book for $150, which is silly on every level. It’s expensive, it kills a tree, and the books are out of date the minute they’re published. What Ginkgotree has done is create the technology where professors can easily custom build a digital textbook for a class. They can go in and say, “I want 11 pages from one textbook and two chapters from another. I want an article from The New York Times and this YouTube video.” From there, Ginkgotree manages all of the rights, pays all of the publishers on a per-page basis, and then provides an elegant digital textbook for students to use that isn’t flat; it’s dynamic. The professor (can then) update the content at any time. Instead of just coming up with a textbook that’s slightly cooler, (Ginkgotree) is totally blowing up the mold of what we imagine a textbook to be. 4. 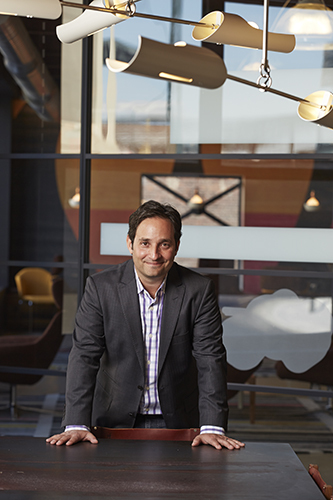 DDN: How should a company approach reinvention? JL: When you talk about reinvention, people often think about a product reinvention, and that’s great, but that’s only one area of reinvention. So if you’re a boat manufacturer, you don’t necessarily have to start making barbecue grills. Maybe keep the boat the same, but reinvent the way you make the boat. Maybe reinvent the company’s culture or the sales and distribution process. There are many areas of reinvention, and I would say that the best companies go from one to the next. They might reinvent their customer experience and once they get that over that goal line, they move on to reinvent another process. That tends to be a very productive approach. 5. DDN: What lessons can people learn from Detroit? JL: Detroit is the perfect case study. Early on, we reinvented ourselves many times. We went from a fur trading industry to manufacturing. And when we raised the concept of reinvention and the importance of innovation, that’s exactly when our city prospered. Then we became complacent. We thought we had cracked the code to success, and when we stopped reinventing, we got crushed. Today, Detroit is exploring different industries like high tech and advanced manufacturing. There are so many new types of people, ways of thinking, organizations, and investments being made (here). And as a result, our city — while we still have many challenges — is in the midst of what I believe to be the greatest turnaround story in American history. To me, the arch is so fascinating: when we aim for innovation, we win. When we stop, we lose, and these wins and losses happen in dramatic fashion.